Halloween is upon us, which is the perfect time to explore creatures that give us the willies. My least favorite creature is revealed at the end of this post. It's totally lame. But I'm me. :) So what about the other creatures, the one's writers have used through the ages to make us pull the covers over our heads or squeeze the death out of a pillow? Matt over on the QQQE highlighted a few of my favs the other day. Go Vampires! Go Zombies! Go Werewolves! (although I prefer the term Lycan and have made mine glow like smoldering copper with eyes swirling in colors. There. Take that sparkling vamps!) I won't revisit any of these, but feel free to hop over HERE to read his take on them. I figured I'd start out soft and spotlight an Angel. Angels can appear as flesh and spirit--clouds of mist and lights. 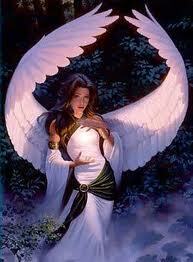 It's said they are heavenly messengers, sent from Above, to guide and protect the mortal world. But don't think that makes Angels all fluffy and feather-coated. No way. Angels are fierce in whatever mission they are given or undertake. They are warriors, bent on winning. Makes you wonder what the real difference is between Angels and Demons, huh? If you're a paranormal/sci fi/urban fantasy writer, why not try creating a different take on an Angel? Next up is a mythical being not so angelic: the Banshee. Gaining a visit from a banshee could likely be the Death of you, forecasting Death or the coming of Death. Their most common disguises are a young woman, an old lady, or a matron, but some believe they can appear as animals, too, primarily in witchcraft. It's also been written that they can be seen in human form, which is probably the reason us MOMs might have heard the phrase, 'My mom is screaming like a banshee.' Banshees are known for their wailing, but also for their low-pitch, which can be as harsh on the ears. What about a Leprechaun? A leprechaun is said to have all or some of the following: smaller stature, likes green (really?? ), drinks heavily and is a tad ornery, enjoys thievery but is a totally tool if caught. He'll hand over his treasure and pretty much kiss your feet. Yuck! There is not much in this world that will freak me out, but seriously, I will totally wig if I see a big one. Ugh...like a wolf spider. I had one of those on the back of my leg when I was pregnant with my second child. Want to see a pregnant chick do Kung Fu and leap in a single bound?? I can totally imagine that pregnant Kung Fu and leap in a single bound - I would probably have done the same thing! What about a giant spider? Like Shelob in The Lord of the Rings? I'm sure you are not the only one who hates spiders. Lol I love fantasy and love all supernatural creatures. Yeah spiders are horrible...but not as horrible as snakes. Can't stand snakes. Not overly fond of spiders myself! Brrr. Angels intrigue as literary devices. In THE LEGEND OF VICTOR STANDISH, I have the young hero discover at the end that his mother is the Angel of Death - which is why she deserts him on the most dangerous streets in America -- so though not being able to bring him with her, she can still be close to him. ROTFL! OMG, I can totally see you doing a Kung-Fu leap! These are awesome. And I'm so glad you didn't give us a picture for that last one *shudders*. I take it the spider scene in LOTR was not your favorite then? I am with you on the spider thing. When I was a teenager I broke my finger trying to swat one away from me! It's amazing how agile a pregnant woman can become when faced with death by spider or roach. I had a similar story with a roach. Loved this post!!!! It's amazing what you can come up with and in the month of October my mind seems to run wild with creepy individuals! I recently acquired The Collector again and he's one hell of a seriel killer. Watch out world! Jen - too sweet, and The Collector sounds fab! I am so with you on the spiders. I know I'm bigger but they still freak me out. ick. Big ugly spiders definitely give me the creeps but I have been known to force myself to capture and set them free instead of killing them. Bats creep me out. The way the dive down when they fly around your house or a bonfire. I'm always terrified of being attacked. hi miss sheri! i love creepy crawlys! yikes! how could you not like those cute furry long legged spiders. they tickle when they walk on you skin. for those angels we been watching that ancient aliens on the history channel so im thinking theyre really aliens. wow! that could be pretty scary for sure.